If a camper is expected to check in or out at a different time than usual, the expected time can be changed for an individual day on their profile page. When the expected time is noted, the camper will be moved from the "Normal" check-in or checkout list to an "Early" or "Late" list. 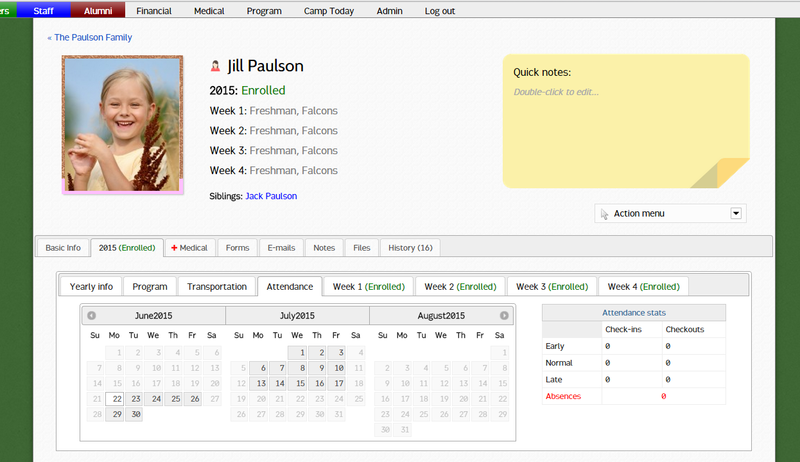 The Year > Attendance tab on the camper's profile displays a calendar with all days for which a camper is expected to be attending camp. To change an expected check-in or checkout time, select a date from the calendar. A pop-up will open and allow you to change the camper's expected arrival or departure time. The new expected arrival or departure will be created and the camper will be moved to the appropriate list for attendance logging.